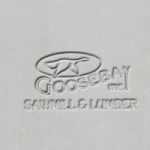 Aspen - Goosebay Sawmill and Lumber, Inc. The sapwood of aspen is white, blending into the light brown heartwood. The wood of aspen has a uniform texture; is straight grained, lightweight and moderately soft. It has a relative hardness ranging from 350.to 420, depending on its sub species. Aspen grows from Alaska through Canada and into the northeastern and western United States. It is in the same family as the poplar tree.